At the 11 miles point with the steepest hill still to come. It was 9.00am as I travelled down the west side of the lake towards Coniston village, the lake was like glass, there wasn’t a breath of wind and the temperature was hovering around 8C, perfect running conditions. I couldn’t help thinking how fortunate I was to be taking part in such an iconic race and for two good causes, namely Meningitis Now and the MCF 2021 Festival. This is what had been motivating me throughout the hard miles of training in the depths of the winter. This was it the toughest race of them all, make no mistake. 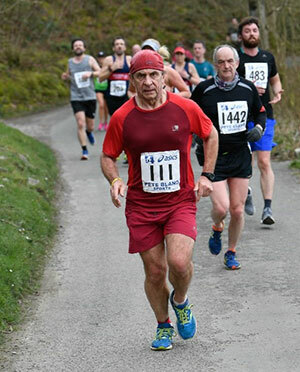 As 11am approached, I was conscious of an Achilles tendon niggle that I’d recently picked up a couple of weeks previous, during a long run over Denim Hills, but was hopeful it wouldn’t prevent me completing the course. It didn’t. My plan was to break two hours and I came home in 1 hour 56 minutes 14 seconds which was half a minute quicker than last year. So, brethren, that’s two down and one to go. At the finish, with my completer’s medallion. The Southport Triathlon awaits me on 19 May. My training for the swim and bike has been going well, and as there’s only six weeks to go, it will be a case of gradually conditioning myself for these two disciplines, as the running training is in the bank, so I’ll just keep ticking over as far as that’s concerned. The event is the Olympic distance, that is to say: Firstly, a 1500m open water swim. This takes place in the boating lake behind the Southport Convention Centre where we hold Provincial Grand Chapter. Secondly, a 40 km bike race which is on the Beach Road and finally, a 10 km run that’s generally around the periphery of the lake and surrounding roads. My sincere thanks to the lodges, chapters and individuals, who have sponsored me thus far, it really does make the whole thing worth-while. The total is now approaching £4,500 which is far more than I ever imagined. 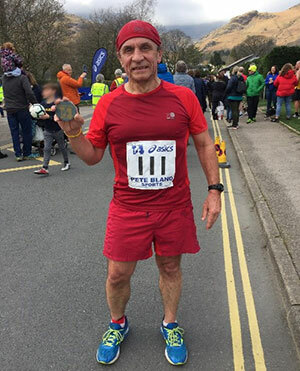 Watch out for Peter’s next report as he finishes the final event of the trilogy in May.